Note: This article is from the Prior Lake American was originally posted on May 25, 2016. 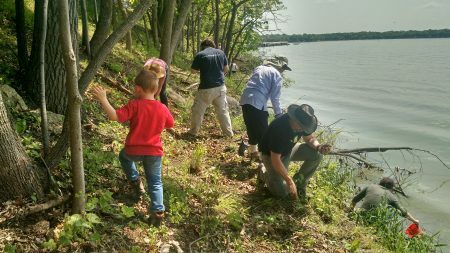 Eighty-three volunteers put on their boots and pulled up their sleeves to help restore more than 1,000 feet of shoreline on the north side of Spring Lake on May 21. The event was led by the nonprofit group Great River Greening, in partnership with the Prior Lake-Spring Lake Watershed District and Scott County. “This event aimed to give lakeshore property owners hands-on experience and the tools they need to restore their own shorelines.” said Maggie Karschnia, water resources project manager for the watershed district. 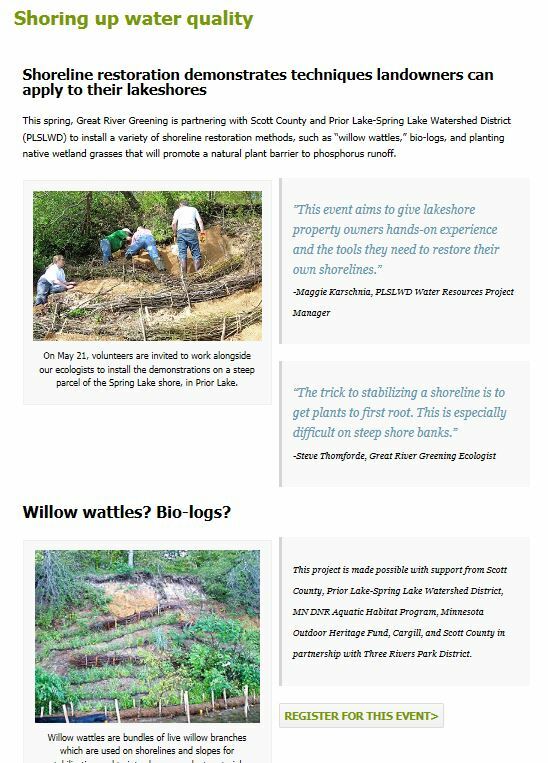 This May, the Prior Lake Spring Lake Watershed District is partnering with Great River Greening and the Spring Lake Regional Park to host a shoreline restoration event on Spring Lake. The event will be held Saturday, May 21 from 8:30 am – 12:30 pm. Volunteers will be able to learn about a variety of shoreline restoration methods and help install them on site! Lunch will be provided after the morning’s work is done. You can register for the free event on Great River Greening’s website. Visit our Spring Lake Shoreline Restoration page to learn more about the project! You can also check out Green River Greening article on the restoration on their website.